The hottest summer England's seen in a long time and I go to Spain for a holiday. Still a great opportunity to spend some time planning the next stage of the project, the lofting and construction table. This is the result. The ladder frame is made from 6"x2" with the legs made from 2 pieces of 4"x2" glued together to make 4"x4". It's 4.2m long and 1.2m wide. 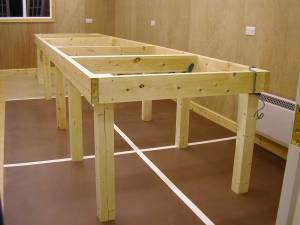 The frame was levelled in situ and the legs individually fitted. So inspite of floor iregularities it's flat. The next job is to fit the plywood top. This table will be used to glue up the scarffed plywood, loft out the hull panels and be the basis for the assembly jig.